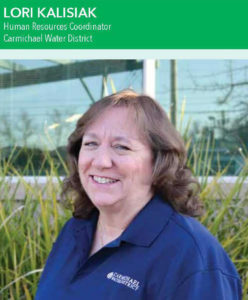 Congratulations to Human Resources Coordinator Lori Kalisiak for being featured in the March 2019 ACWA Faces of Water. As a Human Resources (HR) department of one with exceptional management support, I have the pleasure of being responsible for all areas of HR, including recruitment and staffing, compensation and benefits, employee relations, compliance, policies, payroll, procedures, budget, etc., as well as assisting staff and management with all things HR related. The thing I love most about my job is helping others. Some of the most satisfying times are when I’m able to help an employee resolve an issue related to their benefits, help a supervisor through a difficult process, and see a benefit change come to fruition, to name just a few. I also appreciate being given the freedom to utilize my Information Technology (IT) roots to help others by developing solutions to simplify or automate their processes as well as automating many HR processes. And though it may sound boring to some, I love developing process documentation and assisting others with creating their documentation. How did you get into the water industry? After spending almost 20 years in Information Technology, I chose to stay home with our children until our youngest was in high school. I went back to work part time with a small water district and really enjoyed it. I wanted to find a full-time position where I would be challenged and where I could help others. When an HR position opened up at Carmichael Water District, it seemed like it would be the perfect fit, and it most definitely has been. I have found my technical experience in IT to be unique in the HR field and very useful as HR becomes more about compliance and keeping up with the quickly changing legal landscape. It has also allowed me to bring more automation to the HR processes as well as to other departments. The Sacramento Rivercats. I have so many fun memories of going to the games with family and friends starting with their first season. I was lucky enough to take my Brownie troop when the Girl Scouts were invited to be the very first group to spend the night on Raley field after watching the Rivercats play. Tents weren’t allowed, so the Delta breeze made for a pretty chilly night. Click here to view the ACWA article.